Our 2019 annual fundraising dinner will be held at the Taj Agra Restaurant in Belconnen on Sunday August 4th so save the date now! Early bird special tickets are on sale from now to July 21st at $45 a head. After that, tickets are $50 for a delicious 3 course dinner. Payment is required at the time of booking. Contact us via this website and as soon as payment is received we will email you your ticket. 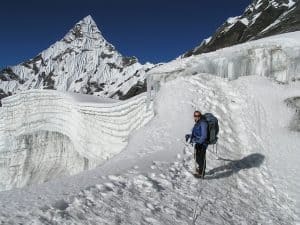 To pay for your ticket(s) by EFT our bank account details are: St George Bank: BSB 112-879; Account number: 477-264-775; Account Name: Roads to Rehab Nepal. We also love it when people fund-raise on our behalf by doing any or all of the following suggestions ! 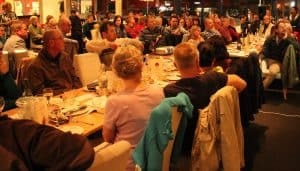 Host an event yourself and turn it into a fundraiser ! 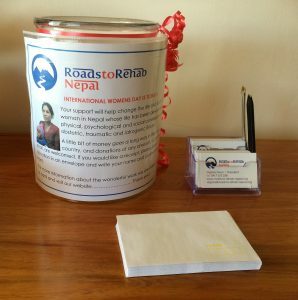 It can be something simple like inviting friends to your birthday party/wedding and having a ‘no presents, donations only’ theme, or a simple dinner/morning tea on a significant day like International Womens Day, International Day to end Obstetric fistula or International Day of People with Disability with a donations jar like this! Christmas and birthdays are big events….Give a gift that gives twice ! In return for a donation we can email you a gift certificate made out in the name of the recipient for any amount or any occasion! Create an event and set up a fundraising page with or without doing something special for yourself!